It is widely considered and accepted that blackjack is a game of skill and, consequently, there have been several blackjack strategies elaborated. Therefore, if you do not perceive that you are able to work out your own winning system, it is highly recommended to look through the existing ones. There are mainly two blackjack strategies that are most used by casino gamblers, which are namely blackjack basic strategy and more sophisticated method called card counting. It is also worth to mention that there is a great difference whether you play single-deck blackjack or multi-deck blackjack as the quantity of decks could bias the results of blackjack strategies significantly. The advantage of using blackjack basic strategy is obvious due to the fact that it allows decreasing the house edge to 0.5%, which is rather low index. Taking to account that blackjack game's main principles are based on card values, which could be represented with a certain quantity of points, players could calculate appropriate blackjack moves in advance if apply blackjack theory in practice. The sense of the strategy is that players choose whether to stand, hit, double, split or surrender depending on their own card combination as well as dealer's visible card - the up card. There are special charts developed, which provide recommendations in case of both soft and hard hands, as well as for different card combinations with certain quantity of points. assume that a dealer deals you with 10 and 7 at the very beginning, which means that in sum you have 17 points. It is rather a decent value, so the best advice here is to stand because in case of hitting or doubling you could easily bust while surrendering is just silly considering such high total. 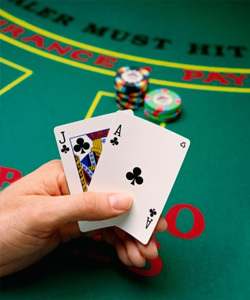 Blackjack card counting is based on the assumption that high-valued cards left in the deck are more favorable for players while low-valued cards are advantageous for the dealer. The explanation is that a dealer should play according to some established rules and usually has no right to deviate from them. Therefore, if a dealer has 17 points in total, which is rather high value, he/she still ought to hit according to the rules and in case of high cards left in the deck, the probability of his/her busting increases, or in other words, players winning chances are higher. Thus, an obvious advice for gamblers is to raise their bets when they have higher odds and decrease them if there are a lot low-valued cards left in the deck. The only thing, which is actually the hardest element of the strategy, is to count correctly what kind of cards remains in the game. In order to do this you should choose one of more than 100 counting systems, which could suit either for single- or multi-deck games, as well as either for experienced players or newbies.